"International Truck ISIS (International Service Information Solution). Электронная база по ремонту грузовиков International." 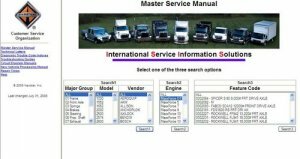 Электронная база по ремонту грузовых автомобилей International Truck ISIS (International Service Information Solutions Master Service Manual) обобщает в себе полную документацию по ремонту и техобслуживанию американских грузовиков International (Интернэшнл), приводятся данные по диагностике, схемы электропроводки, расшифровку диагностических кодов неисправностей и ремонтные норма часы для грузовиков International. В руководстве по ремонту рассмотриваются следующие модели грузовиков International Truck ISIS: International 1000, International 1552, International 1652, International 2000, International 2500, International 2574, International 2600, International 2674, International 3000 FE, International 3000 RE, International 3000, International 3200, International 3200 IM, International 3300, International 3400, International 3600, International 3700, International 3800, International 3900 ,International 4100, International 4200, International 4300, International 4400, International 4700, International 4800, International 4900, International 5000, International 5000i, International 5500i, International 5600i, International 5900i, International 7100, International 7300, International 7400, International 7500, International 7600, International 7700, International 7700, International 8100, International 8200, International 8300, International 8500, International 8600, International 9000, International 9000I, International 9100, International 9100I, International 9200, International 9200I, International 9300, International 9400, International 9400I, International 9600, International 9700, International 9800, International 9800SFA, International 9900, International 9900I, International 9900IX, International IC BUS. Также рассмотрены двигатели Internationall Engines: MAXXFORCE DT, MAXXFORCE 5, MAXXFORCE 7, MAXXFORCE 9, MAXXFORCE 10, DT 360, DT 408, DT 466, DT 466E, DT 530, DT 570, DTA 360, DTA 466, HT 530, HT 570, T 444E, VT 365, VT 275, 530, 530E, 7.3L.